Aside from the health benefits of jogging or running, there are also many psychological benefits of a regular running or jogging program. Some of these include building confidence, stress relief, and the attitude boost of the runner's high. Running is an aerobic cardiovascular exercise. It sends more nourishing blood to the brain, which can help you think more clearly. Running also releases your natural mood-elevating compounds. You learn many things about yourself as you experience running. You can carry these lessons into other areas of your life. Running builds confidence like few other individual sports can. It allows the runner to defeat trial after trial, growing stronger and surer of themselves with each footstrike. It allows you to truly climb hills and clear obstacles. It provides a feeling of empowerment and freedom that comes with knowing that your legs and body are strong and capable. You can gain a better self-image. Running can help train the mind as much as it trains the body. You learn to focus and determination to overcome obstacles and fatigue. You get a new view of large and small problems and your capabilities to endure and overcome them. The will and strength that gets your body through long runs or out the door when you'd rather skip a training run are what, in turn, gives you strength in other areas of your life. Stress relief is another valuable benefit of jogging. Whether by allowing you the time to think about life's problems or time to escape them for a while, tension easily goes by the wayside as the miles fly by. Distance runs are useful for solving problems that are nagging at you. You can clear your mind and let it work in the background, or actively explore your options. Away from the noise of your usual life, you can focus on analyzing the problem from different perspectives. Speed runs are great for tearing through aggression and anger. Focus all that emotion into a few sprints and you'll feel better in no time. 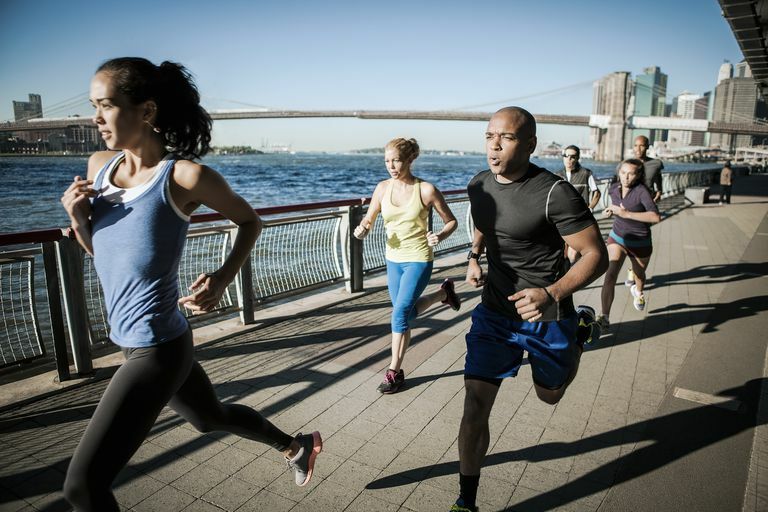 Aside from just the stress relief, jogging has also been proven to improve attitude. Running, especially outside and on trails, creates a release of endorphins that can cause euphoria or just a general sense of happiness. Running has been used for years to treat clinical depression and addictions. Less tension, less depression, less fatigue, and less confusion are just a few of the changes that patients have seen after beginning a regular running program. Running gives something for them to focus on, allowing them to see something besides their depressed state or addiction. Running is good for the mind and the body. Lace up your shoes and take a run as part of your mental health maintenance prescription. Cooney GM, Dwan K, Greig CA, et al. Exercise for Depression. Cochrane Database of Systematic Reviews. December 2013. doi:10.1002/14651858.cd004366.pub6. Esch T, Stefano GB. Endogenous Reward Mechanisms and Their Importance in Stress Reduction, Exercise, and the Brain. Archives of Medical Science : AMS. 2010;6(3):447-455. doi:10.5114/aoms.2010.14269. Hallgren M, Vancampfort D, Schuch F, Lundin A, Stubbs B. More Reasons to Move: Exercise in the Treatment of Alcohol Use Disorders. Frontiers in Psychiatry. 2017;8:160. doi:10.3389/fpsyt.2017.00160.